Count pills, count tablets, count capsules, count gelcaps, count caplets, count lozenges, count softgels – count any solid oral dose product with nearly 100% accuracy – automatically. 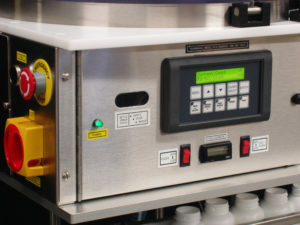 Count on our fully automatic, electronic, FDA-compliant Pharmafill TC3 Tablet Counter machine to count opaque, clear, translucent and even center-hole solid oral dosage products with 99.99% accuracy or better and with dependable performance at high speeds that’s proven to work for decades. 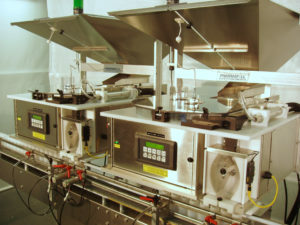 We specifically designed our TC3 tablet counter for automated filling and packaging lines with a large capacity hopper to stage large product quantities and our unique, single-discharge chute for fast bottle throughput reaching or exceeding 50 containers/minute of 50 count per counting machine. It also has a narrow, compact footprint that allows multiple counting units to be placed be side by side on a single or dual lane conveyor to effectively double and triple the counting speed and capacity. Most of the nutraceutical, pharmaceutical, food and other companies that rely on our automated TC3 tablet counter use it as an automatic production filler to boost production speed and efficiency. It continuously counts a preset quantity of pills then fills one bottle after another as a conveyor automatically supplies empty bottles and takes them away once filled. Other growing companies use our electronic counter to strengthen the speed and accuracy of their manual bottle filling operation. 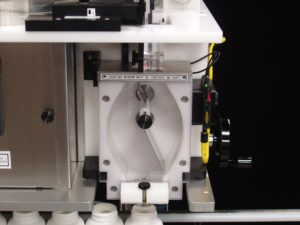 A worker simply pushes a button on the TC3 and a preset number of tablets drops into the bottle set on a conveyor. As demands on production increase, these companies can take more advantage of the automated, continuous filling features. Our TC3 tablet counter counts more accurately than other tablet counting machines because we specifically designed the sensors for fast, highly accurate tablet counting. Our proprietary sensor technology uses a specially modified, custom-engineered sensor that allows operator control over the threshold and the one-shot delay. This Deitz counting technology dynamically regenerates the threshold level every 100ms and flashes an alert if it determines cleaning is needed or if counting accuracy may soon become compromised. For clear and translucent solid oral dose products, the one-shot delay can be adjusted to prevent the possibility of double counts. Our TC3 tablet counter comes with adjustable product guides and other adjustable parts that help automatically flatten the tablets on a single level and arrange them in single file to ensure each tablet falls right into the center of the counting window. This delivers maximum counting accuracy with every type of pill form. We also include a variable speed vibratory feeder chute, which regulates the flow of pills onto the rotating glass disc for accurate, repeatable product feeding timed with the speed of the conveyor. This is a rugged counting machine that we designed with a robust disposition to handle very hard, heavy, virtually non-stop use in thriving filling and packing operations. Yet it’s also very easy for anyone to use with PLC control, very safe with no sharp edges or dangerous, moving parts, and simple to maintain since it needs no lubrication and all bearings are sealed and/or permanently lubricated. No product change parts are involved, setup, operation and breakdown are easy without any tools. Product changeovers take less than five minutes – including testing.